TAIPEI, Taiwan--(BUSINESS WIRE)--Cypress Semiconductor Corp. (NASDAQ: CY), the embedded solutions leader, today announced that its programmable, EZ-PD™ CCG5 two-port USB-C controller with Power Delivery (PD) has now been qualified by Intel for use in Thunderbolt™ 3 host and peripheral designs. Thunderbolt 3 over USB-C enables data transfers at speeds up to 40 Gbps via a compact port with the ability to transmit multiple protocols and provide fast device charging. Reference designs are now available to enable fast time-to-market for PCs, docking stations, hard drives and a variety of other peripherals. Cypress’ EZ-PD CCG5 controller was the industry’s first two-port USB-C controller to support Thunderbolt 3 controllers. 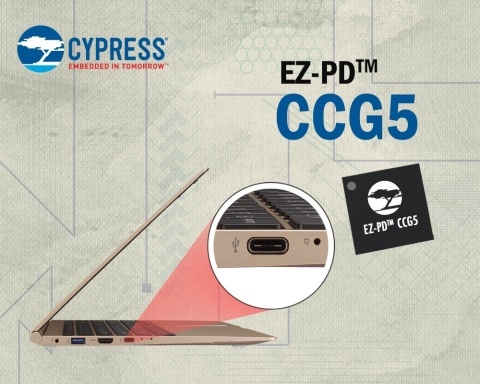 EZ-PD CCG5 enhances the plug-and-play USB-C user experience, while providing bill-of-material (BOM) integration with features such as built-in protection against shorts and electrostatic discharge. The highly-integrated controller increases the reliability of a system by integrating Flash memory that can store two firmware images for fail-safe boot. It offers the EZ-PD family’s trademark programmability to keep up with evolving industry standards. More information on the EZ-PD CCG5 controller is available at http://www.cypress.com/ccg5. The one-chip EZ-PD CCG5 solution minimizes BOM costs for two USB-C ports by integrating 20V regulators, sideband (SBU) muxes, USB high-speed (HS) muxes, high-voltage power FET gate drivers, VBUS-short protection for configuration channel (CC) and SBU pins, dedicated hardware to protect the system against over-voltage, under-voltage and over-current fault conditions, and system-level electrostatic discharge (ESD) protection. The controller also integrates an Arm® Cortex®-M0 and 128KB Flash for fail-safe firmware upgradeability. The USB Type-C and Power Delivery standards are gaining rapid support with top-tier electronics manufacturers by enabling slim industrial designs, easy-to-use connectors and cables, and the ability to transmit multiple protocols and deliver up to 100 Watts of power. The USB Type-C standard’s 2.4-mm-high connector plug is significantly smaller than the current 4.5-mm USB Standard-A connector. More info on Cypress’ USB-C and USB-PD solutions is available at www.cypress.com/Type-C.
Join the Cypress Developer Community, read our blog, follow us on Twitter, Facebook and LinkedIn, and watch Cypress videos on our Video Library or YouTube. Cypress and the Cypress logo are registered trademarks and EZ-PD is a trademark of Cypress Semiconductor Corp. Thunderbolt and the Thunderbolt logo are trademarks of Intel Corporation in the U.S and/or other countries. All other trademarks are property of their owners. Cypress Semiconductor's EZ-PD CCG5 two-port USB-C controller has now been qualified by Intel for use in Thunderbolt 3 host and peripherals designs.